Adrian Clarke looks at tactical battles set to take place in Matchweek 13. 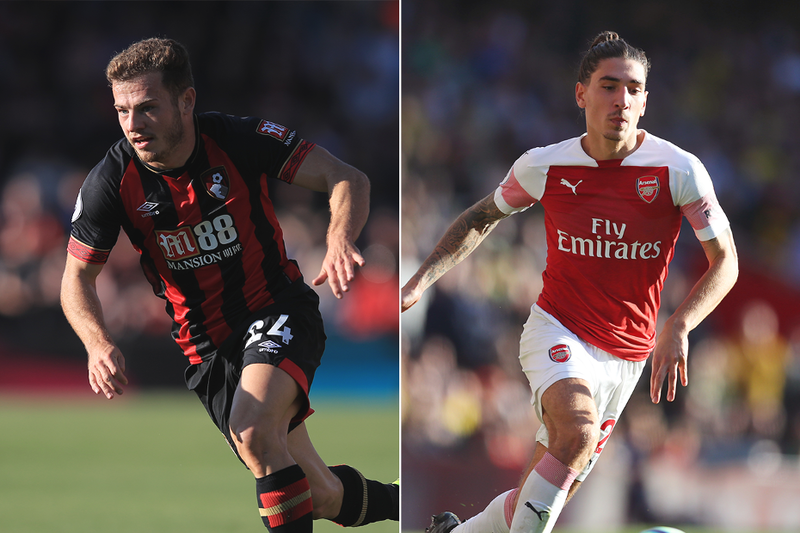 Ryan Fraser's high-speed battle on the wing with Hector Bellerin promises to be one of the highlights of a mouthwatering match between AFC Bournemouth and Arsenal in Sunday's 13:30 GMT kick-off. The Cherries will fancy their chances of troubling Arsenal, who are just a place and four points above them in the table. One reason is because they are enjoying a best-ever start to a Premier League campaign and so confidence is high. Another is that they have a habit of raising their game at home to Arsenal. That is in part due to Fraser, who has been a constant thorn in Arsenal's side. The Scot is enjoying an outstanding campaign. Playing with confidence, the 24-year-old has three goals and is the leading provider of assists in the Premier League with six. He has linked up particularly well with Callum Wilson and David Brooks, laying on two goals and eight key passes for the former and assisting a goal and seven key passes for the latter. Aside from his dynamism on the wing Fraser is also developing into one of the best set-piece takers in the division. He has carved out 12 chances from dead balls in 2018/19, six of which have fallen to defender Nathan Ake. So Arsenal will need to be wary of giving away free-kicks and corners. The responsibility for reining in the threat of Fraser will fall to Bellerin. The Spaniard has improved hugely under the guidance of Unai Emery this season, displaying greater maturity. More mindful of choosing the right moments to go forward and shrewder in his defensive decision-making, Bellerin's consistency has kept the summer signing, Stephan Lichtsteiner, out of the side. As a creative force he has produced a raft of chances for his team-mates. Timing his overlaps well, Bellerin has made seven chances and four assists from the right, with more than half those opportunities falling to Pierre-Emerick Aubameyang. When the 23-year-old flies down the right, Arsenal's leading scorer loves to wait at the far post. If Bellerin can shackle Fraser, it will be a further sign of his development. Fraser is a player who has troubled him in the past. In the thrilling 3-3 draw in January 2017, Fraser outpaced Bellerin on several occasions. Taking advantage of the Spaniard's naive positional play, he scored one goal and won a penalty. Indeed, Fraser's 68th-minute substitution through injury proved a match-changing moment. Without his pace to stretch them, Arsenal fought back from 3-0 down to claim a point. In the 2-1 success for the Cherries last season, Fraser played wide right, giving stand-in Arsenal left-back Ainsley Maitland-Niles a torturous time and providing an excellent assist for Wilson. Although he was on the losing side, Bellerin has some fond memories of that day, striding forward to put Arsenal ahead with a fine individual goal. Fraser and Bellerin will each try to impose his own authority by pushing the other backwards as far and as often as possible. Fraser is one of very few top-flight players who can trouble Bellerin with his pace. However, under Emery, Bellerin's starting positions have improved, which should aid his ability to tackle the flying Scot. Whoever emerges with the upper hand will have enhanced his own reputation and probably helped their side to another three points.